George Crowe has lived in a hospital for the last month. Not because he's sick, but because he has nowhere to go. 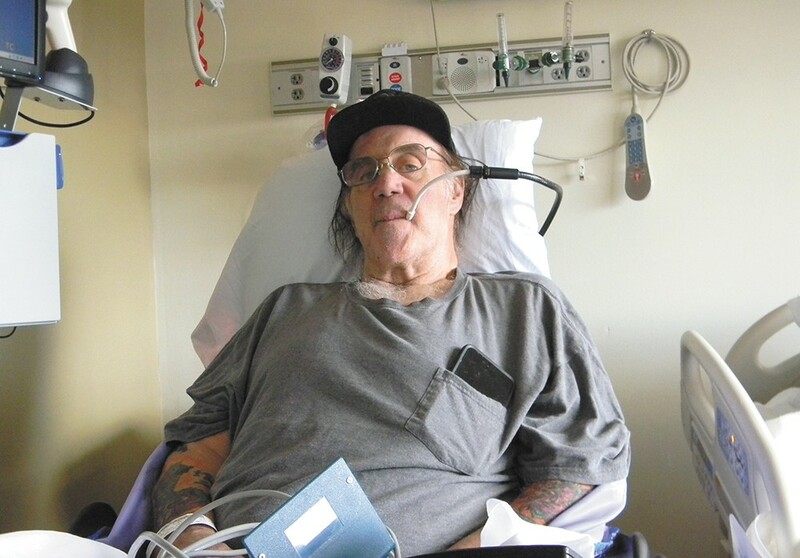 George Crowe, a 67-year-old quadriplegic, was sent to Providence Sacred Heart Medical Center to treat a life-threatening bladder infection last month. A month later, the infection has been treated, but Crowe hasn't left the hospital. That's because he has nowhere to go. Crowe had been living at Arbor Rose, an adult family home on Spokane's South Hill. A bike accident in Pullman last July left him without the use of his arms or legs. After he was released from St. Luke's Rehabilitation Institute in October, Arbor Rose took Crowe in. It was there that staff fed him, bathed him, took him to the doctor and generally did all the things he couldn't do for himself. "They had a fountain out back, and a patio you could sit on," recalls Crowe of Arbor Rose. "And the room was nice, with a big window." But Crowe says that he received unexpected news the morning after he was admitted to Providence to treat his infection: The hospital staff told him that he no longer had his room at Arbor Rose, and his things had been cleaned out. Arbor Rose owner Steve Andrews tells the Inlander he didn't take Crowe back in because the home couldn't provide the level of care he needed and declined to comment further. But Crowe says that his discharge was improper, and suspects it was because Andrews was seeking a different client who could pay more than the Medicaid rate Crowe was paying. The incident is currently under investigation by the Washington State Department of Social and Health Services. For the past month, Crowe has been in a rare but not unheard-of state of limbo where he's lived in the hospital because there is no other adult home or other facility that can take him in. Although Crowe isn't out on the streets, his stay at the hospital isn't cheap. Providence spokeswoman Jennifer Semenza couldn't say exactly how much Crowe's stay costs, but in an email points to numbers showing that the average cost per night at a Washington hospital is $3,189. Floyd McKnight, Crowe's former roommate who now manages his finances, says that Medicare covers Crowe's medical costs, meaning that taxpayers are paying his bill. Providence won't discharge Crowe until he has a safe place lined up. Elizabeth DeRuyter, Providence's director of external communications, says that Crowe could get more appropriate and less costly care outside of the hospital, and hospital social workers are trying to find a more permanent place for Crowe. But there are times, he says, when he thinks he might have nowhere to go: "Of course I'm worried." There's a broader trend underneath this situation: Crowe has been caught in a statewide crunch involving adult family homes, and it's likely to get a lot worse. In the 1990s, adult family homes began growing rapidly in Washington. They're considered a less expensive option than nursing homes, which have more extensive medical facilities, and keep elderly and disabled clients in a residential setting close to family and support. Each of the state's 2,757 adult family homes provide around-the-clock care, including food, therapy, laundry and other services. John Ficker, the executive director of the Adult Family Home Council of Washington State, says that fewer of these facilities are available at a time when they are increasingly needed. "What we've seen overall is a 10 to 15 percent decrease in total beds across the state over the last four or five years," Ficker says. "And we're seeing a demographic change that shows us that there are more and more people in need of long-term care services." According to state numbers, 827,677 Washington residents were 65 or older in 2010. By 2015, that number had risen to over a million, and the population is projected to grow to more than 1.9 million by the year 2040. Ficker also says that people with developmental disabilities are living longer, putting more demand on long-term-care facilities. In Spokane, there are 905 beds in 161 adult family homes, according to Eastern Washington Regional Long Term Care Ombudsman Aaron Riley, most of which he says are currently at capacity. He says that some adult family homes may not be equipped to provide the high level of care for a quadriplegic like Crowe. "The list [of available adult family homes] just keeps shrinking down and down and down," says Lynn Kimball, executive director of Aging and Long Term Care of Eastern Washington, an organization that coordinates services for seniors and people with disabilities. Kimball says there are fewer adult family homes in more remote parts of the state, which she says can be a challenge when trying to place someone near family. Some homes are also better equipped than others to deal with specific conditions, such as dementia or behavioral issues, she says. Ficker says that problems include getting good staff. In 2011, state voters passed a ballot measure requiring that long-term-care workers receive certification showing they've passed background checks and undergone training. Ficker points to a 2014 state auditor's report finding that 42 percent of people who applied to be long-term-care workers did not obtain the required certification and were unable to work. The bigger issue is reimbursement rates from Medicaid, a federal program that pays for the health care of low-income individuals, says Ficker; 57 percent of residents in adult family homes rely on Medicaid to finance their care, he says, and the program's reimbursement rates often don't keep up with the average cost ($110 a day) of keeping someone in a home. The average reimbursement rate, says Ficker, is $87, and can be as low as $47 to provide care, housing and meals for a resident. He says the top end is $150 per day, for clients who often require more care. "It kind of puts the entire industry at risk for not being sustained," says Ficker, who says that more homes will turn to more privately paying clients. On most days, Crowe sleeps until about noon. When he's up, he usually has lunch, then rides around the hospital on an electric wheelchair he controls by breathing into a tube. He likes to go up to a visitor room and watch the trains go by. The rest of the day, he watches Fox News and episodes of Law and Order. He depends on nurses for essentially everything, whether it's scratching his nose, wiping the sweat from his brow, feeding him meals or helping him make phone calls. Long before the accident, Crowe played bass in rock bands in California and worked in the music industry. He lived in Pullman, where he had gone back to school, attending Washington State University as a communications major and living in a house owned by a family he's close to. He says he hasn't been back to the house since his accident, because entering it requires climbing stairs, and it'll require retrofitting before it's accessible to him. In the long term, Crowe hopes to regain movement in his limbs and return to Pullman. In the meantime, he just wants out of the hospital.